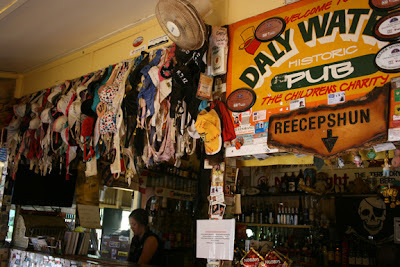 Today our journey takes us to a place called Daly Waters and we are staying at the historic Daly Waters Pub campground. 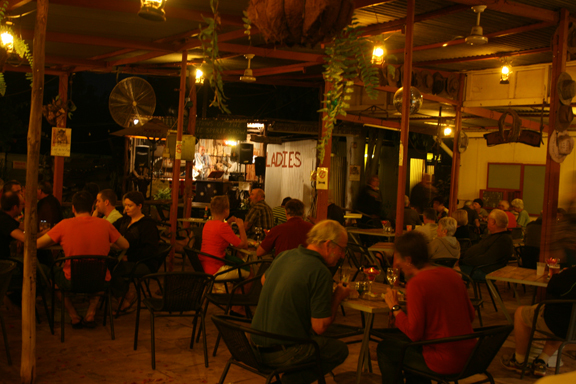 Daly Waters is famous for having Northern Territories oldest pub and Australia's 1st International airport, used during World War 2 as a backup to Darwin. although nowadays it is just a runway. I have read and seen on telly a lot about this pub, so I was really looking forward to staying Here. By the amount of caravans, campers, motorhomes, tents trailers etc. everyone else had Daly Waters Pub on their bucket list too. The pub was originally a supply point for drovers. These days it is a place not to be missed. Every surface is covered in things like car number plates, different currency - both coins and paper, historical items, old farm equipment, even bras and undies. There was so much to take photos of I didn't know which way to turn. They also put on great meals, with their speciality being Beef n' Barra (Steak and Barramundi). There is also entertainment every night with the night finishing with Chilli (Dave Chilcott) singing, telly jokes and reading some of his Bush Poetry. All in all it was a wonderful night in the bush. 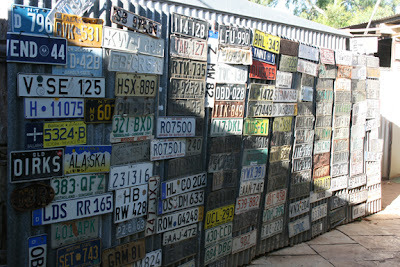 Number plates from all over the world!! Ok. Now you've inspired me to visit, too! Thanks, Davine!